A spending plan allowing Illinois to limp through the month while a long-term budget battle rages failed in the House Wednesday and hopes for a temporary fix dimmed even before facing an almost certain veto by Gov. Bruce Rauner. The Democratic-controlled Legislature and the Republican governor have been have been unable to reach agreement on a budget for the new fiscal year that began Wednesday. So Democrats attempted to keep "essential services" moving, such as operating veterans' homes, child care and police protection, with a $2.3 billion, one-month stopgap. The Senate endorsed the plan. In the House, it needed 71 votes and fell four short. "My goal is to avoid a shutdown of core, critical services," House Speaker Michael Madigan said in a statement as his chamber adjourned until next week. "I believe that should be the top priority of the governor and the Legislature at this moment." Rauner, entering his seventh month in the top spot, has insisted that before negotiating a budget with Democrats, they must approve overhauls to make Illinois more business-friendly and less susceptible to political corruption. Democrats say the ideas, such as restricting lawsuits and payments to injured workers, freezing property taxes and term limits for politicians, are unrelated to state spending and want him to help find money to close a $4 billion gap in the $36 billion budget Rauner vetoed last week. Short of that, they looked for help to keep the lights on in state government in a maneuver used several times in the past decade. Moderate Democratic Rep. Jack Franks of Marengo said he agrees with Rauner on issues such as the property-tax freeze and term limits and "he ought to get some victories." "But ladies and gentleman, we're not talking about statistics, and this is not an abstract thing that we are doing here today," Franks said. "These are real people that, if we don't provide them with the resources they need, real people are going to suffer." Officials are unclear how quickly state services wind down. There is money to pay employees through mid-month, but some vendors providing social services may start scaling back because there's no authority to pay them. The temporary budget could still be resurrected because the Senate approved a separate but identical plan 37-0. Eleven Republicans voted "present" and nine didn't vote. It is possible Madigan, a Chicago Democrat, could persuade four more lawmakers to endorse the initiative to get it approved when the House returns on Wednesday. But even then, Rauner calls it unconstitutional because it is not a balanced budget. Over a full year, it would create the same $4 billion deficit Democrats proposed earlier, according to a letter Wednesday from Rauner budget director Tim Nuding, who said it "marches the taxpayers of Illinois toward an unbalanced budget one month at a time." 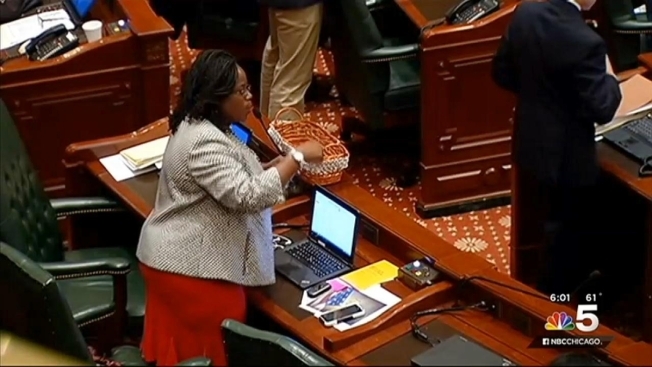 Rep. Margo McDermed, a first-term Republican from Mokena, voiced the exasperation of taxpayers statewide in a plea to both sides to skip the short-term fix and talk. "What's the matter with us, that we're unable to have a discussion, as adults, where we're all invited to the table, and actually make decisions about dividing up the money?" McDermed asked. Without Republican support, a Rauner veto of the bill would be tough to overcome because a legislative override would need 71 House and 36 Senate votes. Aside from the budget-vote drama, the House listened to a second day of testimony on the impact of a state government shutdown, hearing mostly from advocacy groups and worried parents of disabled children because the 15 directors of state agencies invited to testify failed to show up. At a Senate committee hearing on the provisional plan, Tim Egan, CEO of Roseland Hospital in Chicago, said without funding, hospitals receiving state funds may have to lay off staff — a particularly devastating blow to facilities such as his, where emergency treatment often involves victims of Chicago violence. "People will die without a budget agreement," he said. Rauner's office also said Wednesday the governor has borrowed $454 million from special state funds to help manage cash flow and avoid penalties for late payments. Rauner criticized former Gov. Pat Quinn and other Democrats for the practice in the past, saying it was among the "gimmicks" that got Illinois into its huge financial mess. Deputy Chief of Staff Mike Schrimpf said it is different now because of the budget deadlock. And Rauner used his veto powers to nix salary and daily expense increases for state legislators.